Straddling a ridge beside a 175-metre cliff, David Begg describes the seductiveness of climbing up rock without a rope. "You climb a few rock steps and you just want to keep going and you don't really know where you're going," says Begg, who runs Yamnuska Inc., a climbing school based in Canmore. Begg has just finished his lunch of trail mix and water on the summit of Heart Mountain after two hours of guiding two guests up Heart Creek Trail, located east of Canmore near Lac des Arcs. Scramble? For most, the word calls to mind eggs or people in a rush. In the outdoors world, it means scrambling up steep rocks using your hands for balance. Unlike its scary big brother, rock climbing, scrambling sounds innocent enough. Scrambling can be pure freedom. It's exciting adventure that allows climbers to move fast with minimal gear on terrain steep enough to give an adrenalin kick. A few steps off route though, and scrambling leaps into the realm of rock climbing. Sadly, some people realize the dangers of scrambling too late. "There are many scramble routes that cross over the line between steep hiking and climbing. If you slip, it might be your last slip," says Brad White, who has been rescuing people stranded on cliff sides for the past 25 years as a Parks Canada mountain safety specialist. One or two people are killed each year scrambling in the Rocky Mountains of Banff National Park. 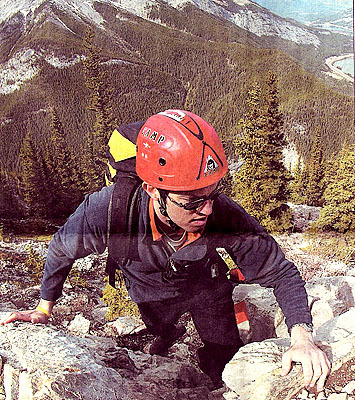 Kananaskis Provincial Park statistics don't differentiate between climbing and scrambling accidents, but at least half of the 47 climbing-related rescues in the park since 2001 have been scrambling mishaps, according to park staff at Alberta Community Development's Canmore office. The other mountainous national parks in the Rockies such as Yoho, Kootenay, Jasper and Waterton see far fewer scramblers, so serious scrambling accidents are rare in these areas. There have been no scrambling deaths in these preserves in the past decade. In Waterton, though, there are more scramblers and more accidents every year, say wardens. On Waterton's Crandell Mountain alone, 30 people have been rescued in eight accidents since 1995. Brent Kozachenko, a Waterton National Park warden who spent 20 years as a mountain safety specialist, says there have been many close calls. "I've had people stranded on cliffs who couldn't move," Kozachenko says. "Divine providence," Kozachenko says with a chuckle. The typical scrambling accident victim is a male between age 17 and 25 who has lived in Banff less than two months. Eager to reach the peaks all around their new home, these young men hear they can bag most of them without rock climbing, say climbing guides scrambling and wardens. The inexperienced hikers quickly latch onto the notion that scrambling doesn't require special training or expensive climbing gear, another factor for these men, many of whom work at low-paying jobs in the tourism service industry rock climbing. Wardens and guides in most of the mountainous parks of southern Alberta warn that inexperienced hikers risk their lives by heading off to learn on their own armed with only a scrambling guidebook. Few scramblers have taken a proper training course, and many beginners don't bother to find an experienced partner for their first trips. "One of the problems we face is how many people are moving out to Calgary each year with no background in the mountains, but who want to be enjoying the mountains," says Burke Duncan, with Alberta's Community Development office in Canmore. "You've got a guy who's 19 working at a Banff hotel and he just goes for it. You've got no fears when you're young," Begg says, whose company will offer its first scrambling courses for the public this spring and summer. "We always advocate taking a course, because you can learn so much from experienced climbers." Those statistics aren't kept for the number of climbing trips versus scrambling trips in the mountain parks each year, some outdoor experts consider scrambling more dangerous than climbing. "Scramblers, in general, seem to be a group that is a little less aware of the dangers involved. Climbers more often have more training and experience before they go out on their own," Kozachenko says. Climbers who use proper gear and techniques are usually caught by their rope when they fall. Most climbers take courses run by professionals before heading out with a partner. Scrambling doesn't have the same built-in fear factor. Every year, climbing wardens throughout the Rockies rescue dozens of scramblers who start up mountains alone, only to get lost on the way up or stuck in a terrain trap on the way down. "It always looks easier from the bottom than it is," White says. The majority of accidents are on the descent. Testosterone and ego often stop scramblers from turning around before they're in over their heads. It's usually easier to commit to going up than down. "Human nature's such that you try to push yourself a little further before turning around," says White, who recommends scramblers stop and call for help if they find themselves in over their heads. Begg's airy perch is 500 metres above the Heart Creek trailhead. Just a few hours before, he stood in the parking lot east of Canmore looking up at his route. Now, he stands a short walk from the summit, taking in the stunning panorama of the front ranges of the Rockies. Just out of Begg's view to the west is the base of the 175-metre cliff below the summit, where a rescue party found the body of a 27-year-old Calgary woman in July 1995, after a two-day search. On her first solo scramble, she fell to her death. "What's seductive is the climbing," Begg says after a moment of reflection. "You quickly get into trouble." Taking a course could save your skin. Yamnuska Inc. is set to offer its first scrambling skills course open to the public. During two-day courses held June 11 and 12, and Aug. 27 and 28 ($240), Students will be taught the following: how to assess terrain for ascent and descent; routefinding techniques; basic rope systems for safeguarding climbers; and how to deal with snow, icy sections and natural hazards. Students also learn how to deal with changes in perspective while scrambling up a mountain Yamnuska instructors tell their charges to look for the route of least resistance while scrambling, but to minimize the consequences of falls by avoiding climbing beside big drops whenever possible. "The most important thing you can teach in a scrambling course is route-finding," says David Begg, director of the Canmore-based company. A common problem for scramblers is finding out the hard way that rocks are easier to climb up than they are to climb down. "A good trick when deciding if you should keep going up is to turn around and see if you'd be confident climbing down," says Begg. Yamnuska students also learn how to stay on their feet while scrambling up lower-angled slopes by looking before stepping; taking shorter steps and using trekking poles. On steeper slopes, students learn to use their hands for balance instead of pulling on rocks like they're climbing a ladder and to stay close together so any rocks dislodged by the leader don't gain much speed before hitting the scrambler below. 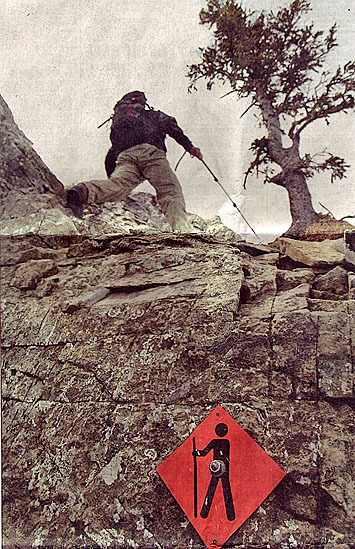 steeper slopes with no handholds are to be avoided, since climbing down will be much more difficult. Scramblers are also told to look for signs of erosion before stepping on or pulling up on rocks. • Take a professionally run course. • Bring a friend with scrambling experience. • Wear warm, layered clothing. No cotton. • Cheek current conditions on your intended route and the weather forecast with the local park warden's office just before heading out. • Explain your experience level to a warden and ask whether the route is beyond your abilities. • Bring the phone number for park wardens in the scrambling area if you have a cell phone. Safety officers can usually reach scramblers within a half hour at any time and rescue helicopters are available during daylight hours.